Tamarind growing tree of the genus Tamarindus also known as Tamarindus indica, Tamarind perennial evergreen in cold weather become deciduous plant, also used as ornamental plant grow in tropic, mediterranean or subtropical climate and growing in hardiness zone 10+. Leaves color green, the leaves shape bipinnate. Flower color yellow with red veins the buds are red. Fruit grow in pods, the color of the peel is brown the inner color of the purple-brown. 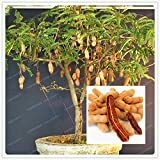 HOO PRODUCTS - 10 Particles / Bag Tamarind Seeds Bonsai Tree Seeds Home Garden Decoration Diy Plant Fruit Tree Seeds Vegetable Seeds Garden Loss Promotion! 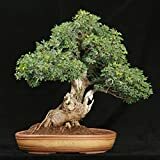 Is it necessary to graft in Tamarind? What can be done with big quantities of Tamarind fruits?